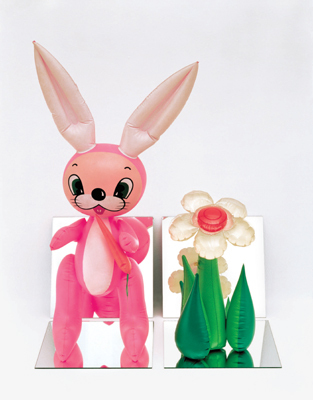 Jeff Koons, Inflatable Flower and Bunny (Tall White and Pink Bunny), 1979, vinyl and mirrors, 32 x 25 x 18". Whether by faking, borrowing, or stealing, artists today commonly produce works of art that employ the vocabulary of industry. This is not surprising if one considers the extent to which the broader contemporary language of form derives from the global corporate system. Unlike in earlier eras, nearly all products now draw on the collective labor of large numbers of people. We are supposed to be contented consumers of the factory-made wares of our brothers, sisters, and distant unheralded cousins in Asia. The message is that the individual can no longer be a producer of things except in highly circumscribed situations, and so artists must continually attempt to reclaim the territory of production or invent new relationships to it.